The AC Item Buy Back Shop is Open! Since 2008, we've had people asking for the ability to buy back gear they've sold or deleted... and for the last two years, we've been telling everyone that we would need to wait until after the server rewrite was complete to begin working on that. But behind the scenes, we've been working on a web-based version... which means we can launch it NOW! Testers have been hitting the new system hard, but now we want a real-time, LIVE test, and that's where our members come in! Why: This is something tens of thousands of players have asked for since the game began... and now we can DO it! When you find one, hit the "Buy" button! What about LQS items? These will NOT show up in the Buy Back Shop, but you can still get your purchased LQS items in game using the shops in your Book of Lore! How much will it cost to buy the items back? You will need to pay the full, original price of the item in order to buy it back. This prevents potential exploits. How long will it take until items I've sold/lost appear in the buyback shop? Why did members get to live test first? Because we needed to try this out on live servers with a bigger group of testers, and one of the perks of upgrading your account is to get to preview new functionality. What about AC-tagged monster drops? Since monster drops are received after battle, not purchased, these are not eligible in the Buy Back shop. What about Wheel of Doom items? 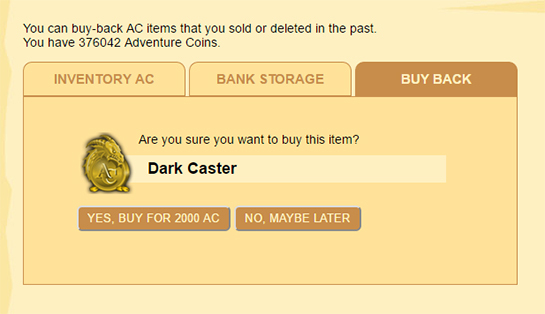 Most of the wheel AC item drops were tracked in our system, and available for Buy-Back. How many of my items does the Buy Back Shop store/display? 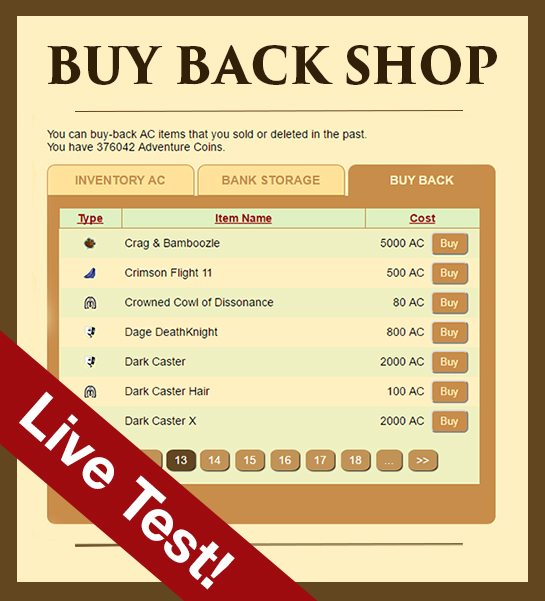 The Buy Back Shop will show ALL of the AdventureCoin items you've EVER purchased, all the way back to your account creation date. Why are you bringing back RARE ITEMS?!!? Never fear, we are NOT bringing back rare items! The only items people can get from the Buy Back Shop are ones they previously bought (then sold or deleted). Why do you not see ALL the items you used to have? Some items, like quest Monster drops, were not tracked as being "purchased" and since they were Zero AC cost items, were not tracked as being "sold". These types of items we can not provide for buy-back. We apologize for not being able to have everything available for buy-back.